(CNSNews.com) - The United States has gone a record 12 straight years without 3-percent growth in real Gross Domestic Product, according to data released today by the Bureau of Economic Analysis. Even so, growth in real GDP improved in 2017 compared to 2016. “Real GDP increased 2.3 percent in 2017 (that is, from the 2016 annual level to the 2017 annual level), compared with an increase of 1.5 percent in 2016,” said BEA. The BEA has calculated GDP for each year since 1929 and the growth in real (inflation-adjusted) GDP for each year since 1930. 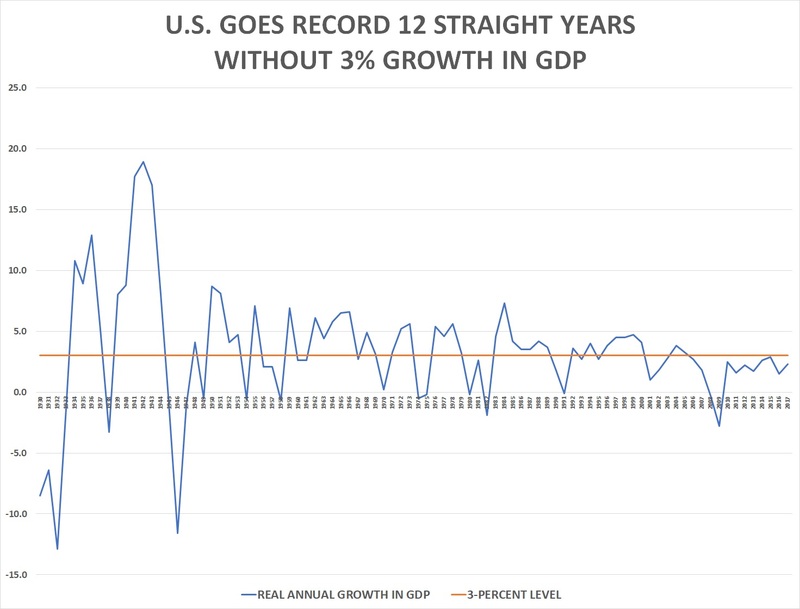 In the 88 years for which the BEA has calculated the annual growth in real GDP (1930 through 2017), the period from 2006 through 2017 is the only twelve-year period in which real GDP did not grow by at least 3 percent in any year. The best growth in real GDP in the period from 2006 through 2017 was in 2015, when it grew by 2.9 percent. The second best was 2006, when it grew by 2.7 percent. The worst two years in that 12-year stretch were during the Great Recession of 2008 and 2009, when real GDP declined by 0.3 percent and 2.8 percent respectively. That recession ended in June 2009. In the eight complete years since that recession (2010 through 2017), there have been three years when real GDP did not grow by as much as 2 percent. Those years were 2011 (1.6 percent), 2013 (1.7 percent) and 2016 (1.4 percent). In 1930, real GDP declined by 8.5 percent; in 1931, real GDP declined by 6.4 percent; in 1932, it declined by 12.9 percent; and in 1933, it declined by 1.3 percent. But, in 1934, real GDP bounced back with 10.8 percent annual growth. The last time real GDP grew by as much as 10 percent was in 1943, during World War II. That year, it grew by 17.0 percent. The last time real GDP grew by more than 8 percent was 1951, when it grew by 8.1 percent. The next year, 2000, real GDP grew by 4.1 percent. But in the 17 years since then, growth in real GDP has never hit 4 percent again, and has achieved 3 percent or better only twice—in 2004 (3.8 percent) and 2005 (3.3 percent). President Barack Obama, who was inaugurated in January 2009 and left office January 2017, is the only president on record (in the years since 1930) who has completed his time in office and who never served in a year when real GDP grew by at least 3.0 percent.